Send this thank you gift basket filled with farm fresh cheeses that were handmade in America by premium cheese masters. Indulge someone who’s very special with mild and buttery Bellwether Farms Carmody, aged Vella Mezzo Secco Monterey Jack Cheese, and sharp Fiscalini Aged Cheddar Cheese - all are unbelievably rich and delicious. With 3 such dramatic and distinct cheeses, how will they ever decide which one they love most! Presented in a pastoral, covered willow basket with fabric liner and includes a stainless steel cheese knife. See WHAT"S THE STORY? for more delicious details about these special cheeses and the farms where they’re handcrafted. 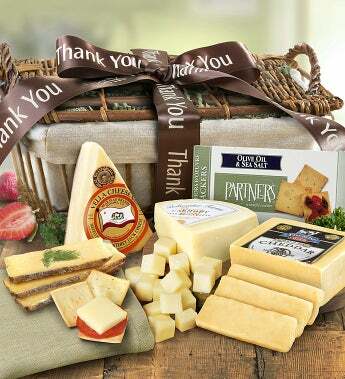 Send this thank you gift basket filled with farm fresh cheeses that were handmade in America by premium cheese masters.